Analog transmission is a method of conveying voice, data, image, signal, or video information. It uses a continuous signal varying in amplitude, phase, or another property that is in proportion to a specific characteristic of a variable. 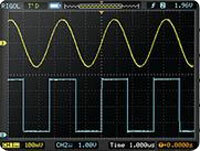 Analog transmission could mean that the transmission is a transfer of an analog source signal which uses an analog modulation method (or a variance of one or more properties of high frequency periodic waveform, also known as a carrier signal). FM and AM are examples of such a modulation. The transmission could also use no modulation at all. It is most notably an information signal that is constantly varying. Data transmission (also known as digital transmission or digital communications) is a literal transfer of data over a point to point (or point to multipoint) transmission medium –such as copper wires, optical fibres, wireless communications media, or storage media. The data that is to be transferred is often represented as an electro-magnetic signal (such as a microwave). Digital transmission transfers messages discretely. These messages are represented by a sequence of pulses via a line code. However, these messages can also be represented by a limited set of wave forms that always vary. Either way, they are represented using a digital modulation method. Analog transmission is capable of being conveyed in a no fewer than four ways: through a twisted pair or coax cable, through a fibre optic cable, through the air, or through water. There are, however, only two basic types of analog transmission. The first is known as amplitude modulation (or AM). This is a technique used in electronic communication and works by alternating the strength of a transmitted signal in relation to the information that is being sent. The second is known as frequency modulation (or FM). This type of communication conveys information over a carrier wave, just as AM transmission. However, FM communication alternates the frequency of the transmitted signal. Data that is transmitted via digital transmission may be digital messages that have origins for a data source (a computer or a keyboard, for example). However, this transmitted data may also be from an analog signal (a phone call or a video signal, for example). It may then be digitized into a bit stream using pulse code modulation (or PCM) –or even more advanced source coding schemes. The coding of the data is carried out using codec equipment. 1. Analog transmission conveys voice, data, image, signal, or video information using an information signal that is continuously varying; digital transmission transfers data over a transmission medium discretely. 2. Analog transmission can be conveyed in four ways: a twisted pair or coax cable, a fibre optic cable, the air, or water; digital transmission may be transmitted via an electro-magnetic signal, such as a microwave. Amitash. "Difference Between Analog and Digital Transmission." DifferenceBetween.net. July 27, 2011 < http://www.differencebetween.net/technology/difference-between-analog-and-digital-transmission/ >.